We are the best partner of fashion & accessories photography. - 3 Lights Setting: Use ring light design which is 20-30% brighter. - The light is even, soft and the power output is stable. - The light is only 3-4cm thick. It is the best light source. - The colour is accurate and the image is sharp. The shooting table can be used with bottom light to get a pure white background. You could shoot at different angles. It saves you a lot of time for photo editing. All photos have accurate colour and rich texture. 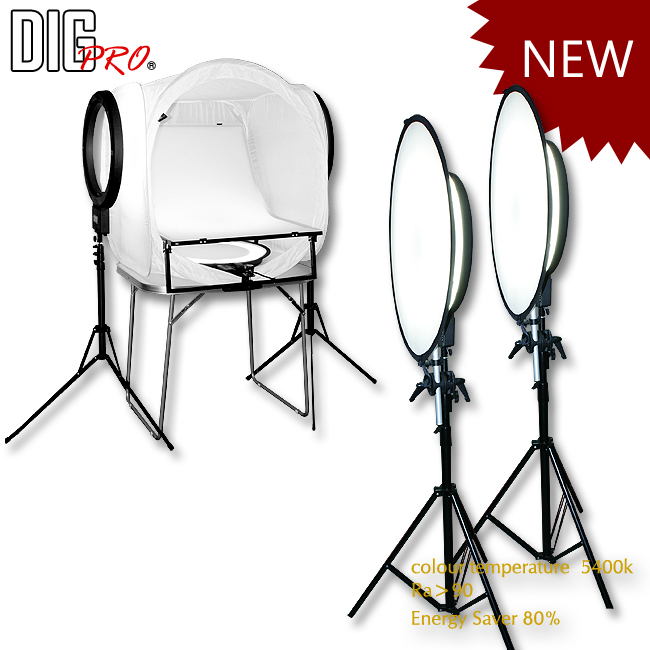 The professional fluorescent studio light provides 5400k daylight temperature. The RA of the light is over 90. You can take a professional photo which has accurate, high saturation colour. Besides, the photo has no shadow or reflection. Save your time for image editing. Continuously lighting design does not need to synchronize with camera flash. You get what you see with any compact DC. The whole set can stand on a table or even a chair. The size of mini studio is 35cm only. It is foldable and easy to carry.